I hope everyone had a wonderful Christmas with their family and friends! I definitely did! 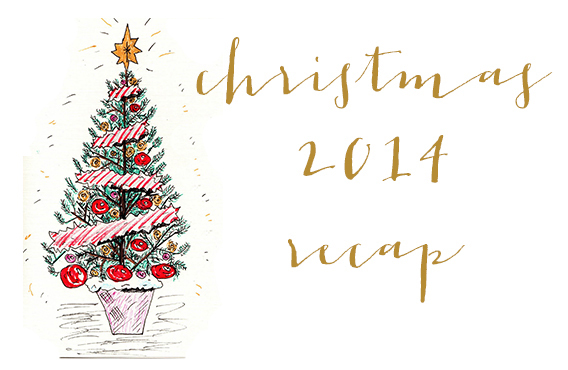 Today I'm going to be recapping my Christmas festivities, although it's kind of a fail post. I planned on taking all these wonderful photos and all that jazz but once I got there I was having too much fun to even remember to pull out my camera and take photos of all the fun. I did manage to snap a few! So let's jump into Christmas with Sam! This Christmas Eve we went over to my cousin's house for a soup dinner and hanging out. I decided to keep my outfit on the casual dressier side but still very much in the Christmas spirit. 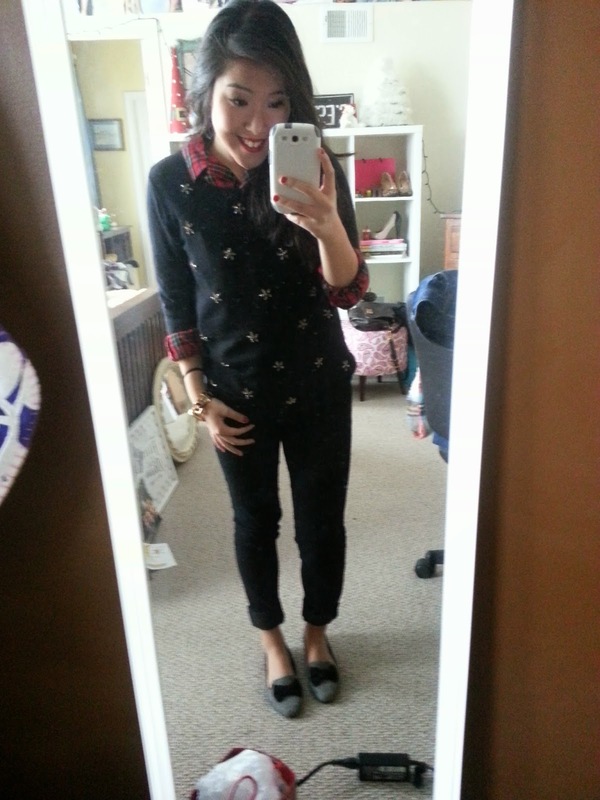 I wore this jeweled sweater with a red plaid underneath, curled hair, red lip and my herringbone flats. 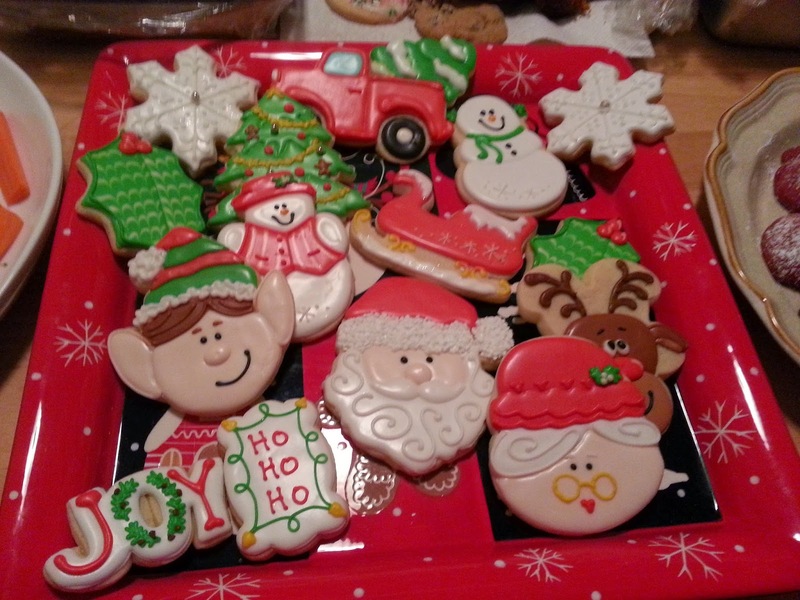 For dinner we had delicious soups and the cutest darn Christmas cookies you've ever seen. I mean how cute are those?! We all died when we saw them! They're some of the best decorated ones I've ever seen. And they were as delicious as they looked! We ate dinner and then sat around and chatted. After a bit we had dessert and I made a one pan pumpkin cake which everyone loved! It was very casual but a lot of fun. He has two daughters and they were the cutest to watch, playing with their presents they got early. After awhile we decided to play a board game. We started off with MadGab but not everyone got the hang of it so we changed to a trivia one. Holy cow this was hard! It was girls versus guys and unfortunately the guys won. Once we finished that we just kept visiting and hanging out. Eventually we all did go home so Santa could visit their home. It was a fun night of memories! We didn't wake up to a white Christmas like some but just knowing it was Christmas put a specialness in the air. Christmas was suuper casual at my house. We all woke up and bummed around. My brother and I woke up super late so we didn't eat breakfast as we were saving our appetite for Christmas lunch! I helped my mom make green bean casserole and I put together the veggie tray and before long it was time for me to get ready! We were doing a new Christmas tradition and that was wearing our pajamas/comfy clothes. I was pretty excited for it and decided on a simple but Christmasy outfit. 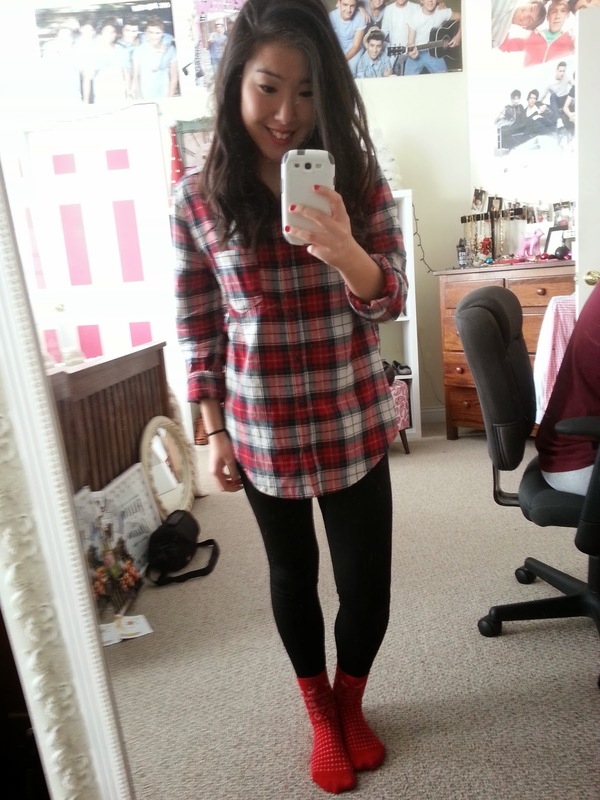 Fleece lined leggings, my favorite plaid shirt and Christmas socks. Around 1pm we headed over to my aunt's house for Christmas! We arrived and said our hellos and then it was time to eat! We had all the Christmas dinner fixings; ham and brisket, green bean casserole, cheesy potatoe casserole, sweet potato casserole, corn, rolls, salad, it was heavenly. I ate my weight in pretty much everything. After dinner we chatted as we let our food settle so we could make room for dessert. We gave gifts to our grandparents and my aunt surprised me with a gift. It was heavy and polygonal. I had no idea what is was. 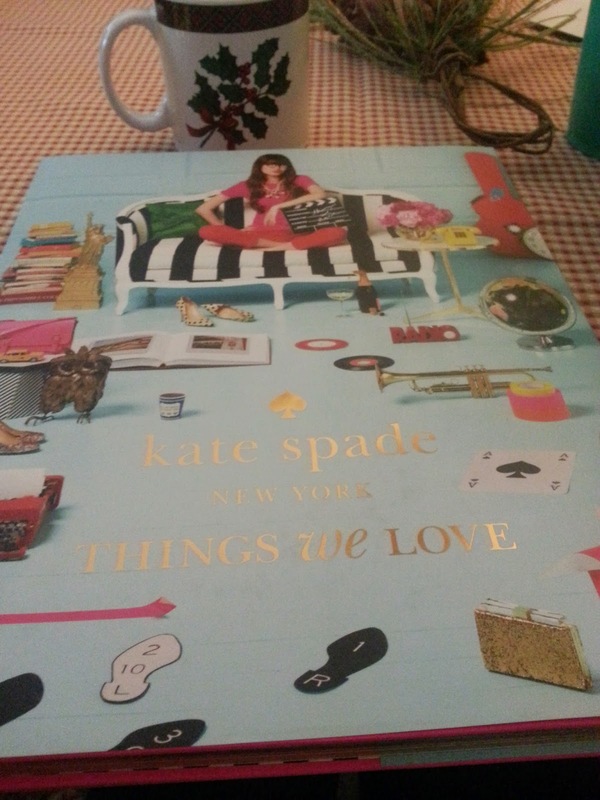 I unwrapped it and it was the Kate Spade 'Things We Love' book! I freaked out because this was something I've been wanting and that was on my Christmas list! Come to find out she reads my blog, so shout out to Diane, the best aunt in the entire world! :) After that we sat around and hung out. We decided to watch a Christmas movie so we watched Home Alone, a classic. My family does a lot of visiting and it's nice to just kick back, nibble on cookies and sip on coffee and coco and just chat. We ate dessert of course which was pies and cookies. Once Home Alone was finished we wanted to watch another movie and Elf was on so of course we watched it. 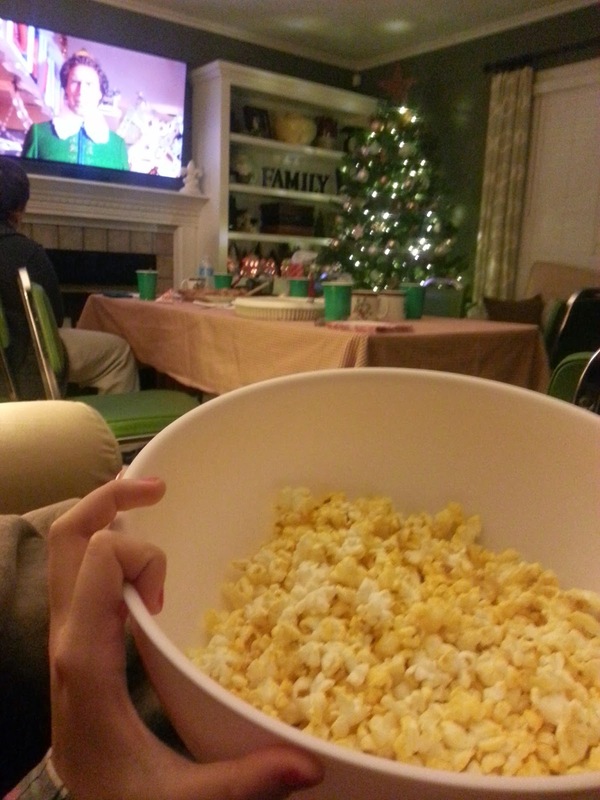 And no Christmas movie is complete without popcorn. During the movie my cousin who lives in California FaceTimed us. My Grandma Shirley has a sister, Aunt Beth, who lives out in California too. It was the best present for her to get to see her sister who lives so far away. 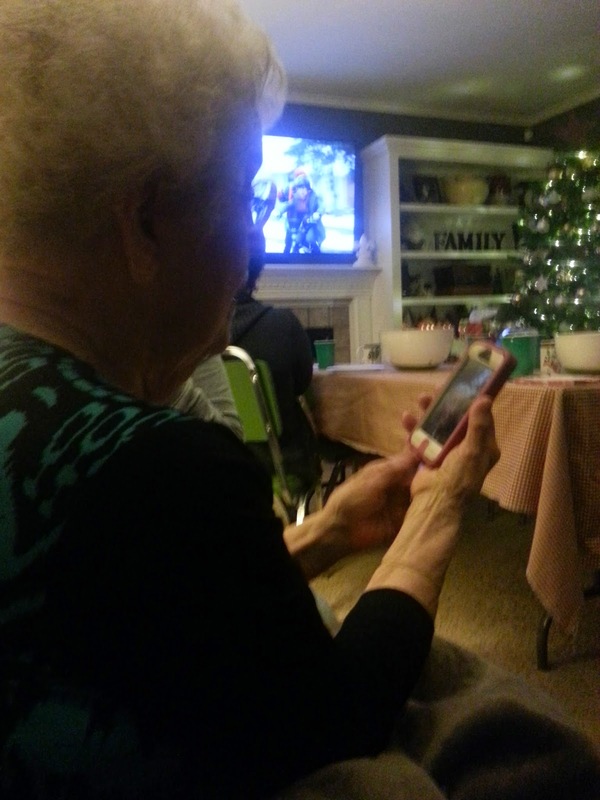 This is one of the best things about technology, seeing the happiness on her face. We all chatted with them, passing around the phone, talking about what's new in each of our lives and how Christmas was. It was nice to see/talk to them and I know my grandma appreciated it so much. By this time it was after 8 and I was exhausted. So we gathered our things and said our goodbyes and headed back home. I had such an awesome Christmas spent with family! And so now I have the Christmas blues. I wish Christmas lasted longer than just a day. It was a very casual Christmas but one filled with lots of laughs and smiles and memories. I can't wait for next Christmas, I'm already counting down the days! "christmas is truly christmas when we celebrate with our loved ones"